Select a portfolio category below to see some featured projects. Click one of the images to view the details. All the images contained on this site are the copyright of the clients for whom they were created. May be published in a brochure, magazine, guide book or optimised for web display. The content can range from a map of an entire country to a site plan of a specific destination. Sanctuary Retreats Produced for a brochure from a bespoke travel company. The colours fit with the company branding, and the choice of fonts suggests quality, reflecting the upmarket tours on offer. The background employs a variety of effects including glows, fades and artistic filters to the hillshading. 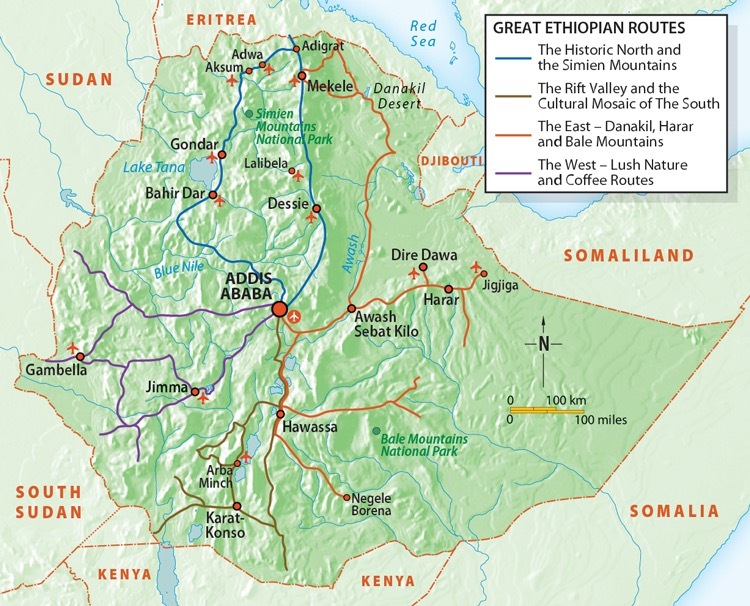 Ethiopian Tourism Organisation One of a number of maps produced for the Ethiopian Tourism Organisation. Ethiopia is fast becoming one of the most popular tourist destinations in the world, with a rich variety of landscapes, cultures and history. 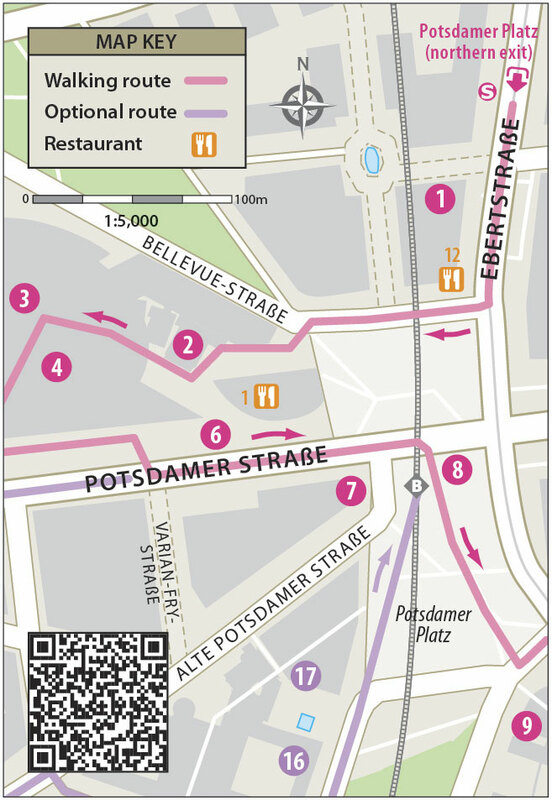 Berlin Guide A small extract from a travel guide to Berlin, published by Steinhart Sharav Publishers. As well as maps of various neighborhoods, itineraries and suggested walks, each book comes with a sheet map to the entire city measuring 1200x500mm. The maps were entered for the 2017 British Cartographic Society awards. Tree Trails Walks Working in partnership with Premm Design gives me the opportunity to work on mapping for many exciting clients, including the BBC, Abercrombie & Kent, the London Stock Exchange, The London Legacy Development Corporation and The Royal Horticultural Society. 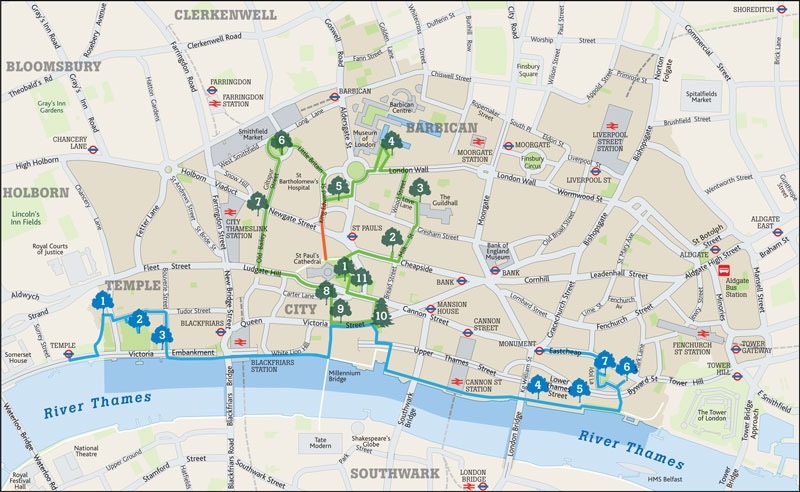 This map illustrating a walk past some notable trees was produced for the City of London Corpora- tion. 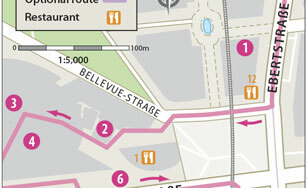 These maps may indicate the route of a walk, cycle ride, driving tour or transport system. 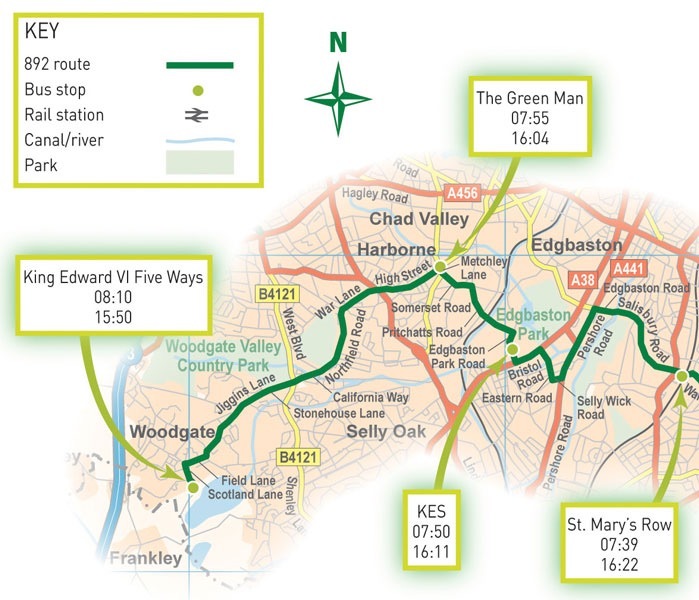 School Bus Routes Produced for Lovell Johns, this is one of a series of maps detailing the many routes of the Green Bus company - the UK’s leader in transport between home and schools. 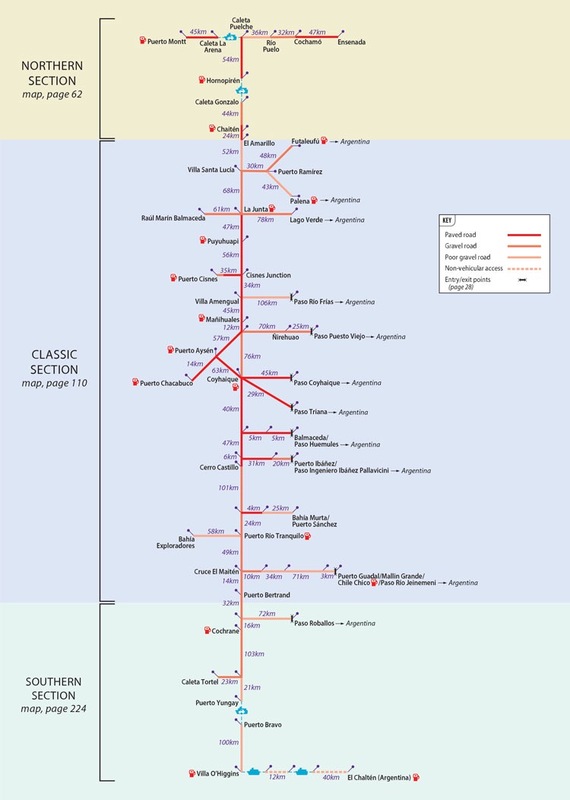 The Carretera Austral A map need not be geographically accurate if that information is not relevant to the user. Harry Beck’s schematic London Underground map is a case in point. The method can not only be used for Transit Maps but also for driving routes as illustrated here. The Carretera Austral is one of the worlds’ most iconic long distance drives, snaking through southern Chile for 1270km. Remember to top up with fuel before departing! 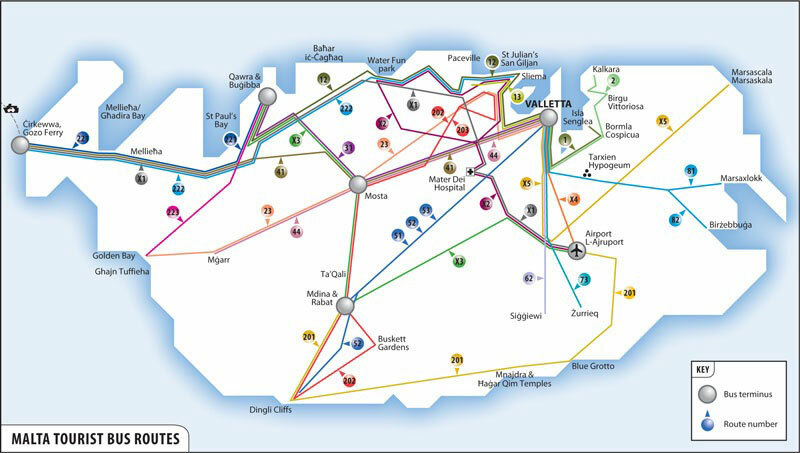 Malta Tourist Bus Routes Another Transit Map, this time showing current public bus services in Malta. A stylized coastline has been included to aid navigation, and the routes themselves greatly simplified. 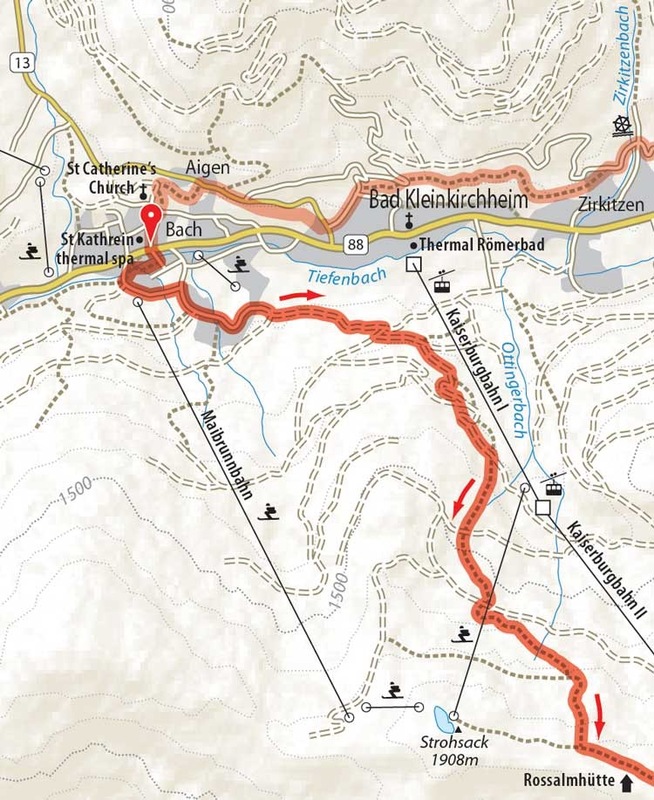 Alpine Walks Unlike a Transit Map, a Walking Map needs to show the surrounding detail to help navigate along the route. Arguably the ultimate in map production. May include Road Atlases, Street Atlases, World Atlases or Thematic Atlases. 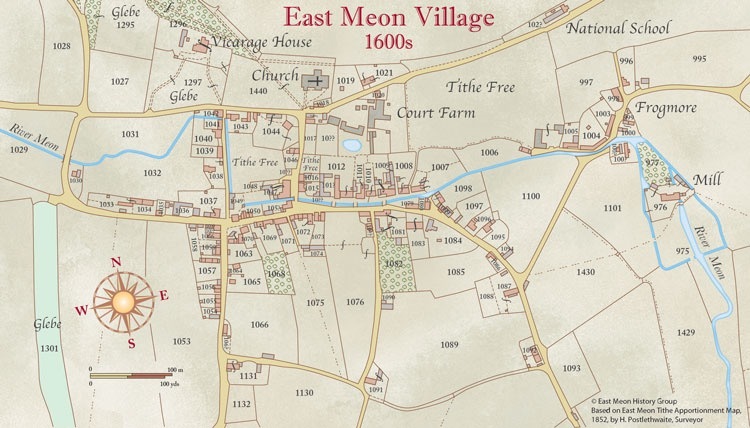 Historical Atlas The East Meon History Group made a successful grant application to the Heritage Lottery Fund in 2016 allowing them to study 1,000 years of agricultural history in the area. A cornerstone of the project is the 1852 Tithe Apportionment Maps. These were captured and assembled into a large display map. In the GIS database 1300 fields are attributed with field name, landowner, tenant, land use, value, acreage and tithes payable. 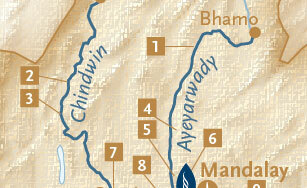 Making selections from these attributes in MaPublisher allowed me to derive any number of maps for the project. UK Road Atlas Despite the emergence of Sat-Navs and the route-finding capabilities on smartphones, some people still insist on having a road atlas in the car - myself for example! 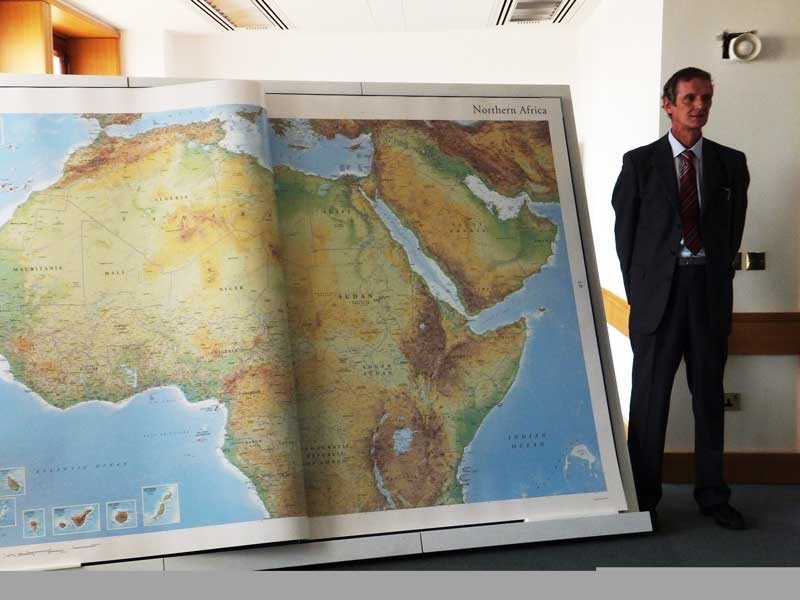 The largest atlas ever made While visiting the London Book Fair in 2010 I had a meeting with Gordon Cheers from Millennium House Publishing, Australia. Here Gordon explained his madcap idea to produce the largest atlas ever published. Two years later I was proud to attend the UK launch of Millennium House Platinum in London. There are still copies available but if you can’t stretch to the $100,000 asking price there is a copy in The British Library. London street mapping The People’s Map London won the International Map Trade Association Silver Award for Best Map of 2010. 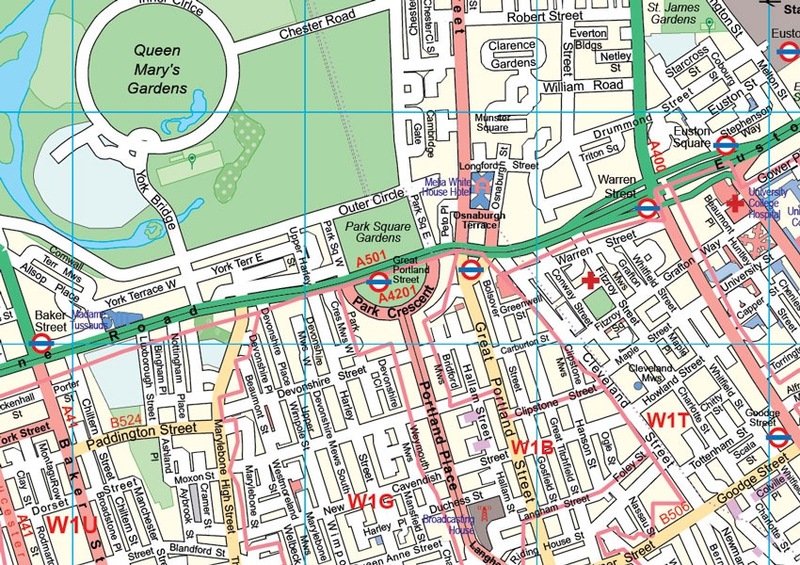 The ambitious project aimed to provide quality copyright-free mapping unfortunately floundered when shortly afterwards the Ordnance Survey succumbed to pressure and started releasing free digital maps of Great Britain, available for anyone to use. Today OS OpenData is the bedrock for much of my work produced for the domestic market. Some maps may have a very specific use, or simply defy categorisation. Here are a variety of such maps. 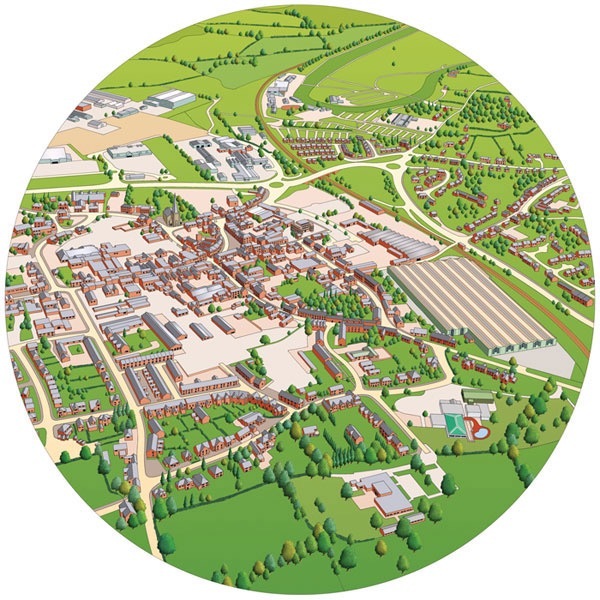 Bird's-eye view maps Produced by one of my trusted suppliers, this bird’s-eye view of Uttoxeter demonstrates another approach to mapping a site. Often used in Theme Park and Festival guides, adding the extra dimension helps to visualise a site in a different way to a conventional 2-D map. Journal publication Working with the Academics from the Geography Department of the University of Sheffield involves preparing materials for inclusion in their papers - maps, graphs, info-graphics and diagrams. Making the sketches provided fit for publication can be challenging - being supplied with materials in all variety of file formats. 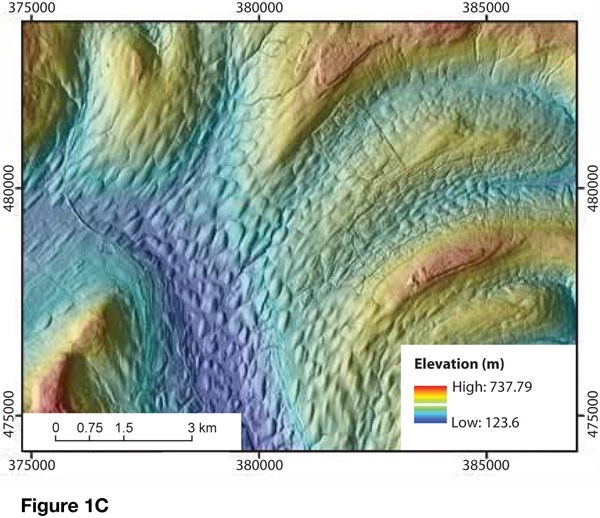 This heat map was published in the journal Nature Geoscience. 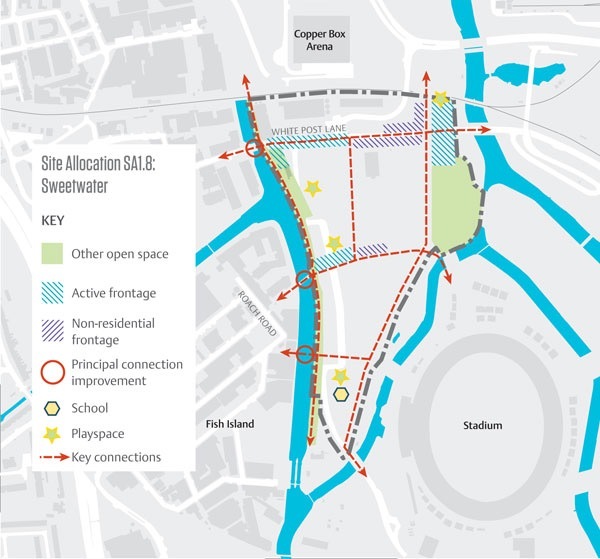 London Legacy Development Corporation Delivering the 2016 Olympics was a major achievement and securing the all important legacy a major part of that. I prepared 60 maps for the LLDC Local Plan 2015–31, as well as maps for brochures, leaflets and route-finding boards around the site. I visit the park regularly and it’s fascinating to see it constantly evolving. Not to say satisfying too, as the maps always need updating! Bridewell Organic Garden The Bridewell Organic Garden in Oxfordshire is a mental health charity providing social and therapeutic horticulture. 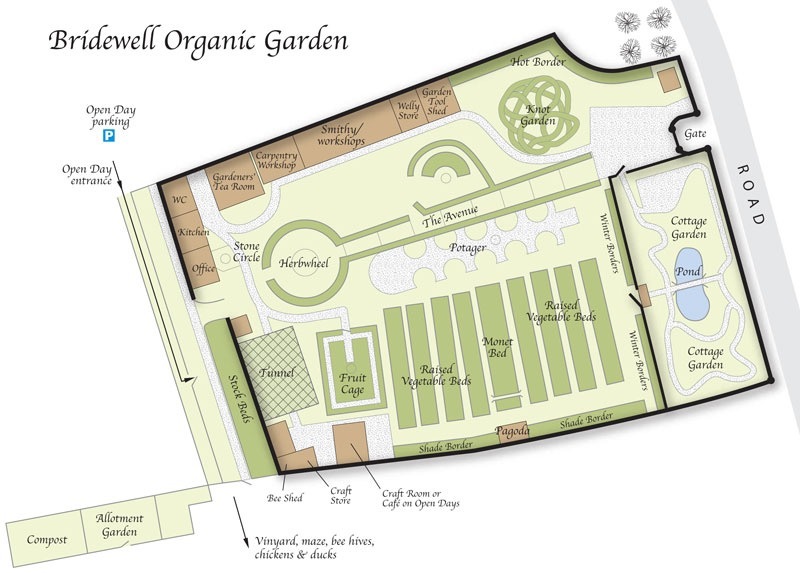 I was happy to produce this site plan free of charge to support their valuable work. It also gave me the opportunity to test my map design skills! "I have worked with David for many years, and his work is to a very high standard. David is flexible and accommodating, and he can always find a solution. David's work is accurate and delivered punctually, usually before any set deadline. I am very happy to recommend David's work." "I have had the pleasure of working with David on various Cartography projects for many years. David is a subject matter expert on Cartography mapping services and he always focuses on the quality of work. He is a good mentor and a very helpful guide to me. I would love to work with David again in any of my future projects"
"We have been working with David on a number of maps for the Travel Sector. His attention to detail, knowledge and capabilities are excellent. Budget and deadline conscious too, David's work has been very well received by our clients. 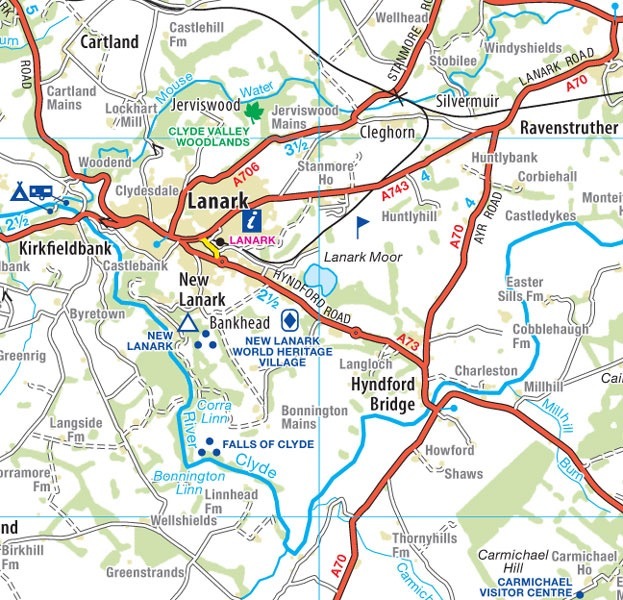 We wouldn't approach anybody else to produce maps for us, he comes thoroughly recommended!" "David and his team has made the production of Earth Platinum the worlds largest atlas possible." 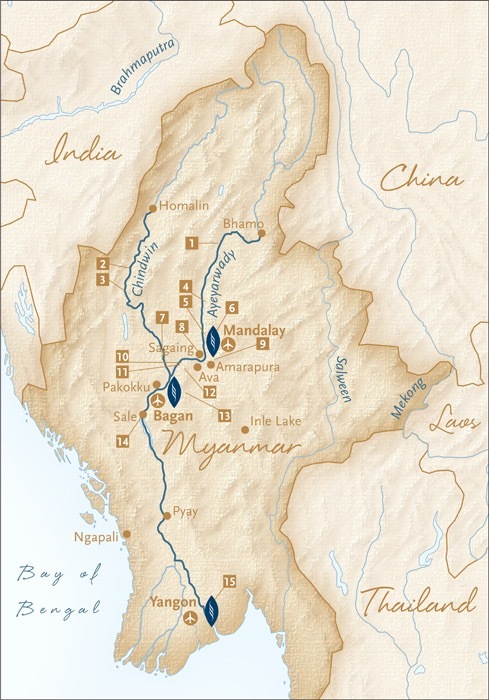 "David has drawn maps for Bradt Travel Guides now for several years, and is the best cartographer I've worked with. He is punctual, painstakingly accurate and very pleasant to work with. I'd have no hesitation in recommending his work to anyone."